I have been following your blog for awhile now, as we also use CM methods combined with TOG. You have no idea how incredibly helpful and wonderful your articles are for me! So much helpful, practical information that I can apply to my homeschool…thank you so much for your wonderful site. Thanks Crystal for the really nice comment. I am so glad that you find my posts helpful and I hope to continue sharing as long as I can. I appreciate this post, Barb. We just need to relax and trust the books more. Charlotte Mason suggested it, but my children taught me to believe it. I just started reading your blot. I am so thankful for the way God is equipping me right now to do What He has asked. This is the first time I have encountered any information about Charlotte Mason in Highschool. I am about to Graduate my third this coming year. 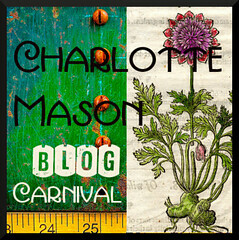 I am looking forward to many if not all of the posts in the blot carnival. What an encouragement all of this is. It spurs me on Ephesians 2:10.